Double Your Pleasure, Double Your CX Fun. It finally feels like proper CX weather; there’s a nip in the air, the trees are changing colors as fast as everyones new team kits, however nobody rocks the pink like Black Sheep Cartel. It’s rained almost everyday this week all of which should make for some excellent cyclocross racing conditions this weekend in Kansas City. 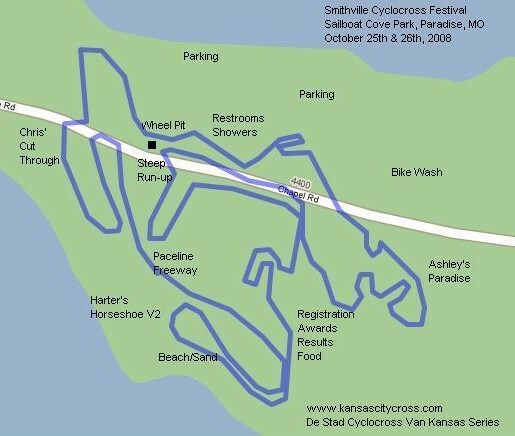 The Smithville Cyclocross Festival is scheduled for both Saturday and Sunday October 25 – 26, along the shores of picturesque Smithville Lake’s, Sailboat Cove designed by “The Cross Guru“, whoever that is. I just hope he’s better than the Love Guru, that movie sucked! You might remember this race as the Riverside Cyclocross Festival. This festival was originally slated to be held in Riverside again but due to midsummer flooding along the banks of the Missouri river just north of downtown Kansas City. Many of the most infamous features of the Riverside race were washed away during the flood in June and July. Just up the river in Parkville, the location for the Boss Cross race sat underwater for a few weeks as well. English Landing Park was just outside my office window before I got laid off, it was sad to see the park underwater, luckily there was little damage to the park and shouldn’t affect that race in any significant matter. It will be interesting to see how the new venue plays out. There is a narrow beach section that runs right along the edge of the lake which could make for some interesting strategy. It will be interesting to see if anyone ends up in the lake. Bringing some dry clothes might not be a bad idea. There’s rumors of tress sprouting money too. The NCCX series continues this Sunday near Boone, NC with the Hawksnest Crossfest on the old Hawksnest golf course in Seven Devils, NC. Now, to truly double your fun. Every day is a good day for cyclocross but Sunday couldn’t have been nicer. Warm but not hot (mid 70’s), overcast so people like me who wear a black kit don’t die from heat exhaustion. The overall field was a bit smaller than the Diamond Blackfan race two weeks ago, however there was a race in Topeka the night before, so I’m assuming many chose one but not two races over the weekend. It’s a long enough drive to Lawrence and back (102 miles) but to drive back and forth to Topeka and Lawrence back to back was too much for me. I can only take Kansas in small doses. We interrupt this blog for a Kris Kross video. You didn’t think I’d let a Kris Kross reference slip by did you? And now back to the blog. It was a fast and very enjoyable course. Lots of single track sections, much more than most courses, way too many gravel road sections though, it was a bit sketchy early before the line was formed. If you were to fall that would probably be the area where it would happen. The two road sections were long enough for you to drop the hammer and gain some serious speed, even the grass sections which were long straight and mostly straight allowing you to keep some speed. 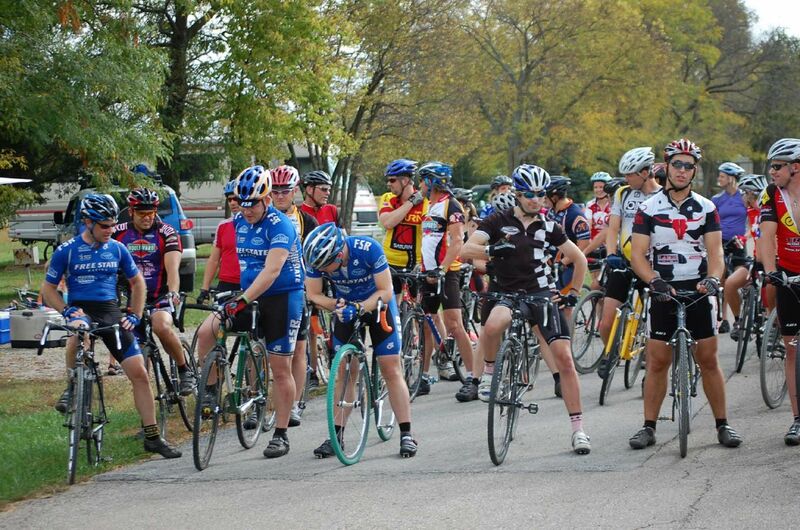 Mens 4’s drew a large crowd, 60 racers plus a hand full single speeders who got added in. It’s still early in the season and the weather is still nice which draws a ton of people who are trying cyclocross for the first time. I guess you have to start somewhere, I know it wasn’t that long ago that I was out there with no clue what I had in front of me. At least I knew better than to wear a sleeveless jersey and tennis shoes. Black Sheep Cartel fielded only one racer, Chris Thomas and finished well enough, 39th of 60, nothing special, but better than last. Small goals were reached; no wrecks, no blood, no mechanicals… Mens Masters B 35+ drew a smaller field as to be expected, but like before they grouped in the Mens B 45+ 55+, Women’s cat 4, and Juniors to the mix to spice things up. BSC’s Chris Thomas finished 15th despite cramping up running the barriers but still picking off 3 other riders on the paved home stretch. Just put your head down and drop the hammer. One bright spot about Lawrence, Free State Brewery, the brewery not the team with the same name. If you’ve driven all the way there’s no good reason not to stop in and eat and drink some really good beer and watch Zeke hit on the waitresses. It’s a long drive back to Kansas City and having a belly full of good food and beer is always nice. Oh yeah, almost forgot, we hit the Cold Stone Creamery too, delicious! See you at the Boulevard Cup next Sunday at Wyandotte County Park. You know, where they had the cyclocross national championships last December.